Sunday of the Paralytic. Orthros and Divine Liturgy. In those days, as Peter went here and there among them all, he came down also to the saints that lived at Lydda. There he found a man named Aeneas, who had been bedridden for eight years and was paralyzed. And Peter said to him, “Aeneas, Jesus Christ heals you; rise and make your bed.” And immediately he rose. And all the residents of Lydda and Sharon saw him, and they turned to the Lord. Now there was at Joppa a disciple named Tabitha, which means Dorcas. She was full of good works and acts of charity. In those days she fell sick and died; and when they had washed her, they laid her in an upper room. Since Lydda was near Joppa, the disciples, hearing that Peter was there, sent two men to him entreating him, “Please come to us without delay.” So Peter rose and went with them. And when he had come, they took him to the upper room. All the widows stood beside him weeping, and showing tunics and other garments which Dorcas made while she was with them. But Peter put them all outside and knelt down and prayed; then turning to the body he said, “Tabitha, rise.” And she opened her eyes, and when she saw Peter she sat up. And he gave her his hand and lifted her up. Then calling the saints and widows he presented her alive. And it became known throughout all Joppa, and many believed in the Lord. At that time, Jesus went up to Jerusalem. Now there is in Jerusalem by the Sheep Gate a pool, in Hebrew called Bethesda which has five porticoes. In these lay a multitude of invalids, blind, lame, paralyzed, waiting for the moving of the water; for an angel of the Lord went down at certain seasons into the pool, and troubled the water; whoever stepped in first after the troubling of the water was healed of whatever disease he had. One man was there, who had been ill for thirty-eight years. When Jesus saw him and knew that he had been lying there a long time, he said to him, “Do you want to be healed?” The sick man answered him, “Sir, I have no man to put me into the pool when the water is troubled, and while I am going another steps down before me.” Jesus said to him, “Rise, take up your pallet, and walk.” And at once the man was healed, and he took up his pallet and walked. Now that day was the sabbath. So the Jews said to the man who was cured, “It is the sabbath, it is not lawful for you to carry your pallet.” But he answered them, “The man who healed me said to me, ‘Take up your pallet, and walk.’ “They asked him, “Who is the man who said to you, ‘Take up your pallet, and walk’?” Now the man who had been healed did not know who it was, for Jesus had withdrawn, as there was a crowd in the place. Afterward, Jesus found him in the temple, and said to him, “See, you are well! Sin no more, that nothing worse befall you.” The man went away and told the Jews that it was Jesus who had healed him. The life of the Paralytic, who waited at the sheep pool, which in Hebrew is called Bethesda, was dramatic. For thirty eight years he was paralyzed and abandoned. Alone, amongst so many ill people and fellow country men, waited with patiently the miraculous movement of the waters, which cured the first person to fall in. In this environment Christ meets with the paralytic. God meets with His creation. The God-man with man. Christ approached with philanthropic intentions the Paralytic and asks him: “Do you want to be sound?” The Lord with discretion asks, in order to cure; with love He seeks, in order to save. The Paralytic waited patiently for thirty eight whole years and his hopes were never wear down, he never disbelieved, he never drew back. He awaited, although all his friends and relatives had abandoned him. Everyone returned back to their homes, works, families, because they saw that nothing is happening. In vain they were trying to help their relative, to throw him in the pool. Meanwhile others, more advanced, were healed and he remained ill. Their faith and hopes had wear away and they abandon him. 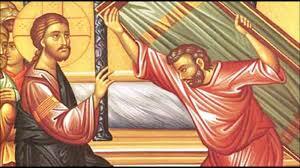 The paralytic expressed his complain to Christ by saying, Lord, I have no one to assist me”. Lord, I have no one! I have no relatives! I have no friends! I haven’t any fellow man, who would like to stay with me! I remained alone, in the loneliness of my illness and my sufferings, and no one is found to offer me help! Every day, the five galleries of the pool of Bethesda were full of crowds and invalid, but nevertheless no one was willing to share the Paralytic’s sufferings. As, today, millions of people suffer from different bodily or spiritual diseases, and all with one voice cry out: “Lord, we have no one”! Diseases, which torment man and deliver him to depression and affliction; to isolation and loneliness; and man cries out with a loud voice: “Lord, we have no one”! Affliction and pain are interwoven with our life. Wealth and material goods do not prevent their invasion into our life. They are brought in by the malaises and sicknesses of our beloved ones. They are brought in by the ingratitudes of friends and relatives. They are brought in by the slanders and mucks. They are brought in by suspiciousness and misunderstandings. They are brought in, when our work and services are not recognized; by feelings, which were reputed and hopes, which were never fulfilled. Affliction and pain stand before man’s life and knock the door of all. They do not know anyone or any society, conditions or positions. They do not distinguish between poor and rich, learned or illiterate. The Paralytic of today’s Gospel reading, followed a program of a sinful way of life. The Lord, is not satisfied to cure him. The sins of the paralytic had ruined him. It would be worthy to cure him, but under the precondition, that he will sin no more. Sin and the prodigal way of life are the reasons of man’s different tribulations. Our moral and family sufferings have their roots in our own desires. We cause them with our own foolish behavior and sinful deeds. And because of this reason, our Lord commended the Paralytic, “You have become well; sin no more, so that nothing worse happens to you” in other words, now you have been heeled, be careful not to practice a sinful life, in order that nothing worse happens to you. Unfortunately, although all of us know that this advice is so logical and true, we tend to violate it. We allow our pride to overrule our logic. We run the risk of participating in mischievously amusements, irrational alcoholism, paranoid smoking, unnecessary vigils when playing cards, unlawfully sexual relationships, and calamitous companies with evil men. How many times, although we had promise, that we shall not sin, we had found ourselves in the mortal tentacles of sin? How many times, although we had the will to withstand to our sinful desires, we had from the first moments surrendered to the passions of the flesh? How many times we felt strong, but have been proven weak? If the soul is not under God’s Grace, sin will always prevail. Sin drags and humiliates man. The Prophet David says, “If the Lord has not built the city, in vain the builders labor. If the Lord has not protected the city, in vain the guards watched all night”. When man sins, he sins with an ill will, without moral strength. Thus man, who becomes a slave to sin, is compared to an ungovernable ship, which has no helm, neither compass nor anchor. This condition makes man paralytic spiritually and bodily. At the end he is dragged to death itself. St. Paul, the Great Apostle of the Nations, says, “The bread of sin is death” (Rom. 6:23). “How miserable am I’ who will deliver me from this body of death?” and he answers, “through our Lord Jesus Christ” (Rom. 7:24-25), because “the grace of God is eternal life” (Rom. 6:23). St. Great Martyr George. Orthros and Divine Liturgy.